I have never had a deep fryer at my disposal, but even if I did I think this recipe benefits from high heat oven ROASTING because there’s a caramelization that takes place as a ‘floret’ loses moisture in the high heat that is not duplicated in the closed atmosphere of hot oil. It’s that crispy, sweet and nutty caramel bit that combines perfectly with the funky saltiness of the fish sauce, which is the central skewer flavor note of this dish. So, here’s the deal: Alison is CRAZY about Brussels sprouts. Besides garlic and Sun Gold tomatoes, it is the one vegetable in our garden that she will go out of her way to make sure is well planted, fertilized, and harvested. I like Brussels sprouts fine, but I like the sulfur-y funk of all brassicas. 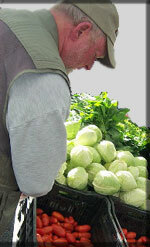 I tend to lean to the asian varieties of bok choi, tot soi, pac choi, and the like. Before we learned how to best grow Brussels sprouts in our own garden, Alison would always seek out a stalk or ten of them at the local farmers markets where they sell them still attached to the stalk (saving the farmers some labor). We would keep them in the barn through the late fall and early winter where they didn’t mind (and, in fact, were sweetened by) the cold temps. Until some time in 2007 Alison’s favorite Bs recipe was a NYTimes Mark Bittman special: Brussels Sprouts With Bacon and Figs. Nice, fun, and autumn-y. But not an every day thing. In 1999 when Ruth Reichl was named editor in chief of Gourmet Magazine we became subscribers for the first time. Gourmet was always the magazine of our food obsessed parents, but its Olde School heavy cream focus was something we and our food obsessed friends always looked to rebel against. But Reichl was one of us, obsessed with new flavors and simple techniques. I call it the “Loaf [of bread], Wedge [of cheese], and Bottle [of wine] School” of food. The original recipe, which came to light in a Gourmet Mag article, is a GREAT example of the Loaf Wedge and Bottle School: classic side dish (brassica florets) treated in an entirely new way that is better than anything we’ve ever tasted before. 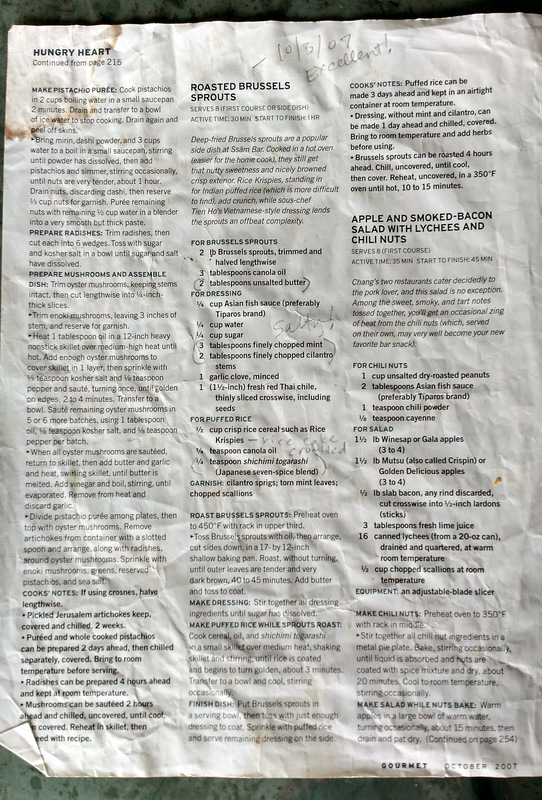 As you can see we still have this recipe ripped from the magazine, complete with mark-ups. However it’s dated October 2007, which is far beyond the time when we had initially been subscribers — by then we were hard-core Cooks Illustrated readers. This page must have been passed on to us from some other subscriber, but it landed in a good place. What’s interesting to me, in comparison with the Momofuku Cookbook version of this recipe, is to see that Chang switched things up by putting out the Brussels sprouts version of the recipe, which is not what his restaurant (Ssäm Bar) was serving at the time (cauliflower with boondi). However, having tasted several iterations of this dish, in my opinion he might have inadvertently published the best of the variations. Chef Tien’s Fish Sauce Vinaigrette is no secret, and has been gushed over (with good reason) by many people. It goes with many things, particularly rich and meaty (literally and figuratively) bits that need a kick and a cut. The real key to this recipe is the roasted/deep-fried nature of the florets, and the Romanesco provides the pinnacle of these parts. There is some complex transformation that takes over a brassica leaf when it browns in the high heat, whether on the surface of a frying pan, submerged in hot oil, or on a sheet pan of an oven. The moisture flees and the carbohydrate structure wilts surrounded by the many sulfur compounds found in the cells (which may, apparently, be good for us). The sugars form and are instantly caramelized, and that sweet flavor is instantly tempered by the bitter sulfur notes. Below the brown tips and edges are the juicy (one might even say meaty) pith of the plant with its own pleasant sweetness and substantial texture. In addition to providing narrow browning edge bits, the fractal crenelations are also ideal areas for a light dressing to pool, allowing maximum flavor combinations in the recipe. The boondi or toasted puffed rice are a simple lily gilding of crunch to echo those crispy leaf/flower edges, and the shichimi togarashi spice lends the dish a far-out feel. The Momofuku recipe adds fresh cilantro leaves along with fresh mint leaves to provide a whisper light counter to the heavy funk of sulfur and fish sauce. Every taste bud is enlisted, and every taste bud can’t help but stand at attention. Since our 2007 discovery this recipe has been in our regular autumn rotation as our stems of Brussels sprouts migrate into the kitchen. Right now (it’s Oct 15, 2015) there are 10 or more stalks of Brussels sprouts in our garden waiting to be funked up in some way, mostly this way. But, weirdly, there are also these alien stalks with a fractal hat among them; strange fruit born by seeds neither of us can remember ordering or planting. But there they are, and rather than letting them simply flower and die we’ve decided to eat them. It turns out they are IDEAL for this recipe. There’s so much feathery edges that when roasted it’s a panoply of sweet and sulfur crispy goodness when separated into bits, drizzled with your fat of choice, and then roasted at a high heat (we use 450degF in a convection oven). SO IDEAL that it gets boring and the food obsessed must push it farther, so here it goes. With apologies to Chef Tien I think there’s a simpler solution to the vinaigrette, but it requires very specific ingredient: Sun Gold cherry tomatoes. Separate head or pick sprouts and place bits on a sheet pan. Drizzle with your choice of oil/fat. Place sheet pan in pre-heated oven. Pour puffed rice on a separate sheet pan and sprinkle with the togarashi. Add tomatoes to a sauce pan with a bit of water (to start the cooking without burning the skins) and place over medium heat for about 20 minutes. After tomatoes have cooked and begun to shrivel amidst the leaked sauce, put them through a fine food mill plate to separate the skins and seeds from the sauce. Peek at the brassica. Make sure it’s not burning to black. If so take it out, if not, let it go. Cook the sauce another 10 to 20 minutes over medium heat until it coats a cold spoon, then add the fish sauce and turn the heat to low. Peek at the roasting brassicas. You’re looking for the external bits to be a deep milk chocolate brown, at which point they are ready. Remove the brassicas, turn off the oven, put puffed rice pan in the same oven. Toss the brassicas in a bowl with tomato sauce. Once thoroughly coated, removed the spiced puffed rice from the oven and toss into the mix along with any chosen optional ingredients. Serve immediately. This “version” of the fish sauce vinaingrette omits the water and the sugar but adds the tomatoes and all the extra flavor that they bring. It also omits the cilantro and the mint leaves at the end, which could be added back, but don’t seem necessary. The key, to me, is the meaty funky substance of the brassicas set off by their perfect complement sauce. Bon appetit. This entry was posted in Elsewhere, Maine, recipes etc, vegetables and tagged broccoli, brussels sprouts, cauliflower, gourmet magazine, momofuku. Bookmark the permalink.